Wednesday's debate for the Republican nomination yielded some very interesting sound bites, from Rick Perry and Mitt Romney's back-and-forth regarding job creation to Ron Paul promising a gallon of gasoline for ten cents. One comment in from Minnesota Representative Michele Bachmann stood out as being particularly absurd - asked about immigration using a hypothetical situation involving a completed fence and cheap gas, Bachmann alluded to revoking citizenship to the children of immigrants and used a funny personal story to drive her point home. HARRIS: Congresswoman, you said the fence -- that you believe the fence is fundamental as an integral part of controlling the border. Let's say that in 2012 or 2013, there's a fence, the border is secure, gasoline is $2 a gallon. What do you do then with 11 million people, as the Speaker says, many of whom have U.S.-born children here? What do you do? BACHMANN: Well, again, understand the context and the problem that we're dealing with. In Mexico right now, we're dealing with narco terrorists. This is a very serious problem. To not build a border or a fence on every part of that border would be, in effect, to yield United States sovereignty not only to our nation anymore, but to yield it to another nation. That we cannot do. One thing that the American people have said to me over and over again -- and I was just last week down in Miami. I was visiting the Bay of Pigs Museum with Cuban-Americans. I was down at the Versailles Cafe. I met with a number of people, and it's very interesting. The Hispanic-American community wants us to stop giving taxpayer- subsidized benefits to illegal aliens and benefits, and they want us to stop giving taxpayer-subsidized benefits to their children as well. HARRIS: A quick 30-second rebuttal on the specific question. The fence is built, the border is under control. What do you do with 11.5 million people who are here without documents and with U.S.- born children? BACHMANN: Well, that's right. And again, it is sequential, and it depends upon where they live, how long they have been here, if they have a criminal record. All of those things have to be taken into place. But one thing that we do know, our immigration law worked beautifully back in the 1950s, up until the early 1960s, when people had to demonstrate that they had money in their pocket, they had no contagious diseases, they weren't a felon. They had to agree to learn to speak the English language, they had to learn American history and the Constitution. And the one thing they had to promise is that they would not become a burden on the American taxpayer. That's what we have to enforce. While there were a couple interesting things about her response, there was one comment in particular that was strikingly hypocritical. Bachmann talked about her photo-op with Cuban-Americans in Miami and how illegal immigrants and their children should not receive any benefits funded by taxpayers but what she failed to acknowledge is that many Cuban-Americans immigrated to America and upon touching American soil were granted amnesty and qualified to receive government entitlements. Prior to the 1980s, there was no real policy in place and Cubans were admitted to the country as political refugees. 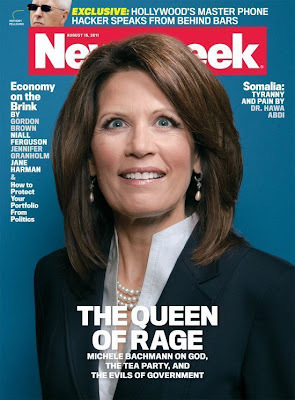 Why is it different for a Cuban to come to America and be granted protected status because of the political situation in Cuba when Mexicans coming to America seeking employment and protection from what Bachmann calls "narco terrorists" are "burden[s] on the American taxpayer?" If you look at the demographics of where Bachmann was talking to these Hispanic-Americans, roughly one-third to one-half of that population were born outside America. This demographic has been subsidized by the government for decades. A majority of the population Bachmann cites as inspiration for her harsh words against other Hispanics, are essentially illegal immigrants - the only thing different is that the government looks the other way for Cubans.